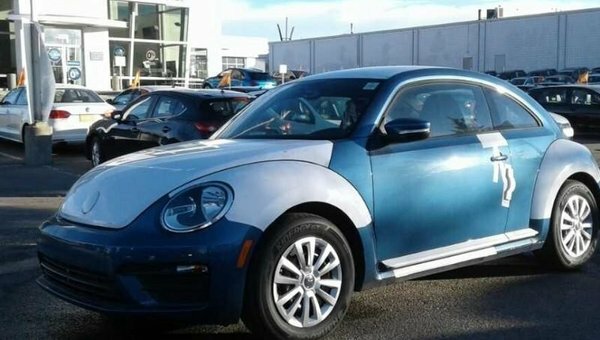 The 2018 Volkswagen Beetle is quickly becoming a luxury city compact with a lot of style and flair. In the latest beetle, options such as a rear view camera and smart phone integration have become a standard, furthermore adding to the value this historic compact holds. 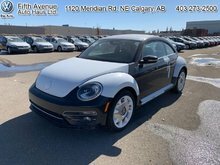 With an excellent safety rating and overall five star performance the 2018 Volkswagen Beetle is definitely worth thinking about. This silk blue metallic hatchback has an automatic transmission and is powered by a 2.0L I4 16V GDI DOHC Turbo engine. Motivated by that economical motor it gets 9.0 L/100 km in the city and uses just 7.2 L/100 km out on the highway according to Transport Canada. Our Beetle's trim level is Trendline. 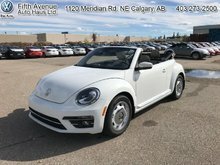 This historically styled 2018 Volkswagen Beetle Trendline, offers more than the standard automatic gearbox. 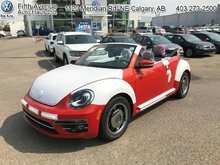 Other options include power door and trunk locks, 8 speaker stereo with a 5 inch display, Bluetooth, heated front seats, remote keyless entry, air conditioning, a back up camera and much more. This vehicle has been upgraded with the following features: Convenience Package. 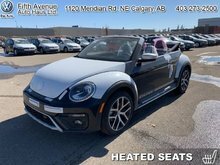 To view and download a brochure open this url http://www.vw.ca/content/medialib/vwd4/ca/brochures/cars/2015/brochure/en/beetle-coupe_/2018-beetle-coupe-brochures/_jcr_content/renditions/rendition.download_attachment.file/c76758_my18_bro_beetle_e_modelpages.pdf. We've discounted this vehicle $750. Buy this vehicle now for the lowest bi-weekly payment of $139.92 with $0 down for 96 months @ 5.99% APR O.A.C. ( Plus applicable taxes - documentation fee / Total cost of borrowing $7653 ). Incentives expire 2019-04-01. See dealer for details.